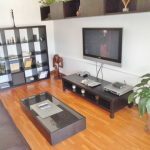 Renovated apartment in the trendy Gracia neighbourhood, very close to Paseo San Joan. The apartment is the ground floor of a beautiful “finca regia” building with entrance directly on the street level. It’s located on a quiet and semi-pedestrian street, with a relaxed local vibe with lots of small shops and cafes. The apartment has a good sized living room as you enter the apartment with L-shaped sofa, one double bedroom seperated from the living room with large black iron windows to allow natural light, one spacious complete bathroom and fully equipped American kitchen with direct entrance to the private terrace of 18m2. The terrace is the star of the apartment, with custom built in benches and garden with automated water sprinklers. The terrace has afternoon sun and is a great place to relax in the warm climate, take a glass of wine on a cool summers night or host a dinner with friends. All the apartment has been renovated with high quality materials and lots of attention to detail, such as the micro-cement floors and bathroom furniture that give an industrial loft feel, the custom made wooden dining table and kitchen countertop and the original restored mosaic floors. The apartment also has high ceilings with wooden beams and exposed brick walls, and air-conditioning. 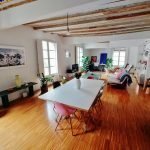 This is a unique apartment that will make a great “pied-a-tierre” for anyone searching a brand new apartment with private terrace in one of barcelona’s most popular neighbourhoods.